At Reception Flip Flops, we are completely transparent and we charge our customers exactly what we pay in shipping. In addition, we get a discount from FedEx and UPS because of our shipping volume which we pass on to our customers, while still being able to charge a decent and competitive price for high quality flip flops. As of January 2017 FedEx and UPS changed how they calculate cost for packages. Now for any packages that are over 12" they will be calculated via dimensional weight. Please refer to the image below for calculations. Each of our boxes of 24 flip flops is 24" x 10" x 9" and weighs 9 lbs. 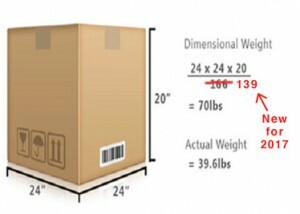 With the new dimensional weight calculation ( 24 x 10 x 9 / 139) the weight used to calculate cost of shipping for our boxes is now 16 lbs not the actual weight of 9 lbs, which makes the cost of shipping markedly more. But how do some companies charge so much less for shipping you may ask? A few companies on Amazon and Ebay sell cheaper quality flip flops so they are able to hide some of their shipping costs in their margins to make it seem like you are paying less for shipping, which is perfectly fine if the cheaper quality is what the person is going for. While other companies are so large that they can afford to skimp on shipping because they sell not only flip flops but a multitude of other things at extremely large volumes, which is difficult to compete with shipping wise. There are even some companies that charge less for the flip flops but grossly overcharge for shipping. These are just some things to look out for. We are small company and we strive to offer a competitive price for a high quality flip flop and be as transparent and fair as possible about the shipping costs. We hope to retain your business and we appreciate it greatly! If you have any further questions please don't hesitate to email us at info@receptionflipflops.com.